ON THE GO OC - Things to do with your family. : 2 Easy Dinners for the Same Night! 2 Easy Dinners for the Same Night! Two super fast and easy meals for same day dinner! I know right, what am I even talking about two dinners for one meal but yes that is what I said and did tonight! Well, because I have a picky eater and someone who will eat anything, tonight I decided to try chicken strips. I had three strips of chicken, skinless and boneless left in my fridge for my picky eater who is now eating home made chicken nuggets again!! 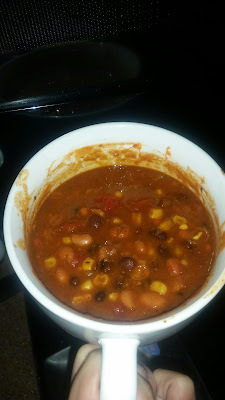 I also had all the goodies to make a vegetarian chili for the rest of us. 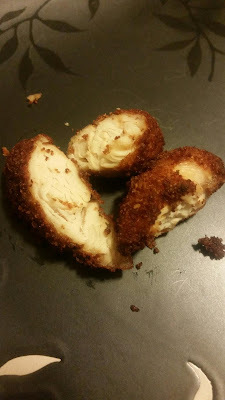 Toss Chicken Strips into and coat with a bread crumb mix with garlic salt, lemon pepper, salt, pepper and then just toss it into a pot of oil that is going to fry them on the stove top. Make sure the chicken heats to temp and ready to eat. Mine took about 11 mins for three pieces to fry and cook ready to eat. Let all of this simmer for 25 mins and serve. Add a little cheese and sour cream to the top and finish with fresh chopped onion and enjoy! Chili is one of my most favorite meals ever. In the winter it becomes one of my most cooked. I love to toss all of this with ground beef into the crock pot too but this time it was vegetarian so it was easy to do stove top and fast! The best part of tonight's dinner is that the chicken strips turned nuggets are GONE and there is just enough Chili to send my hubs to work with. Chili is always better on the second day!